Last week, I did something different for lunch. I had a fabulous, 6 course, gourmet lunch. And the best part? It only cost $15. It’s a hidden gem in Houston that no one seems to know about and you’ll never guess where it is – Houston Community College (HCC). The lunches are prepared solely by the culinary students and are served at HCC’s downtown campus every Thursday during the fall and spring semesters. The prix fixe menu changes weekly and offers an appetizer, soup, salad, intermezzo, entrée, and dessert course. I heard about these lunches from Jami Martino, an old friend of mine who is a chef and an instructor at HCC. She wanted to let more people know about this great dining opportunity which benefits students and diners. Proceeds from the lunches are used to treat the students to a fine dining experience at the end of the semester but students also get valuable experience in preparing, plating, and serving dishes in a real world setting. Diners get an expertly prepared meal at a bargain price. I highly recommend attending one of these lunches if you’re in the Houston area. If you would like to make reservations or want to know more about upcoming menus, contact Jami at jamie.martino1 (@) hccs.edu. When I went last week, I had deviled quail eggs, broccoli soup, a bacon, poached egg and asparagus salad, blood orange mimosa sorbet, grilled lamb chops with roasted baby vegetables, and an apple tartlet. Every course was delicious but the blood orange mimosa sorbet was my favorite. It was fun and a little unexpected. I liked it so much that I asked Jami for the recipe. She was kind enough to share the recipe with me so I could share it with you. Blood oranges add beautiful color to any dish and the oranges I had were especially vibrant and deep red. It took some scrubbing to get all the blood orange juice stains out of my countertops but it was totally worth it for that kind of color. Make sure you like the taste of the sparkling wine you use in this sorbet because its flavor will come through. You don’t have to buy anything expensive. I used a Brut Rosé that was only $13 based on the recommendation of the wine guy at my favorite grocery store. 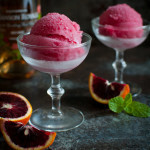 I loved it – it was a perfect match for the blood oranges and it was pink. Enough said. The alcohol in the wine is not cooked off at all so you probably don’t want to serve this to your kids. However, this would be perfect for those upcoming bridal showers or mother’s day brunches.